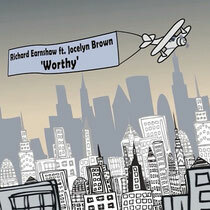 Is there a better vibe than a slab of soulful house, with vocals supplied by the legendary Jocelyn Brown and production from one of house music’s top producers, Richard Earnshaw? We can’t think of one. This new track, out exclusively on Traxsource on October 1st, everywhere else on the 15th, is a truly magical piece of music that reminds you why you got into this scene and emphasises that if you look for it, there’s quality music out there. For fans of Richard, you’ll know that this track was originally on his 2010 artist album, ‘In Time’, and rather than letting a beautiful song lie, it’s been remixed for 2012 by some of house music best producers. Switzerland’s Jamie Lewis adds some quality sax instrumentation, producing a remix to the high standard that you would expect from the house don. With the original included too, the final remix is from Frankie Knuckles and Eric Kupper aka Director’s Cut, who seem to be adding their golden touch to many productions just now. The original always was outstanding, having more reasons to play it again just makes it even better! Make sure to check the video below, directed by Chris Musselwhite, its gospel feel is inspirational.